Not all dog owners will use a harness or a halter on their friend. 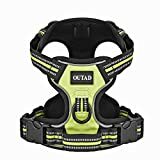 Dog halters and harnesses have a very specific role to play and you should not be fooled into thinking that the use of either will be an easy training aid for a mature dog. Harnesses are a good alternative to the use of a choke chain. Choke chains have a place in the dog world, but not everybody agrees what that place is. 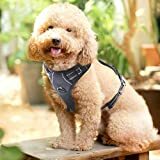 The advantage of a harness is that it is comfortable for the dog and gives you a larger degree of control over the torso of the animal that a collar simply does not allow. Dog harnesses come in many different sizes, dependant on the size of your dog. It is worth bearing in mind that the bigger your animal is, the more likely a harness is to help you control the dog. You may also want to consider a harness with reflective bands if you tend to walk your dog mainly at night. This provides added protection from road vehicles. 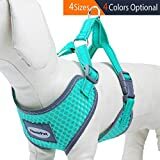 Additionally you can buy dog car harnesses for your friend if you are concerned about their well being when you are travelling. 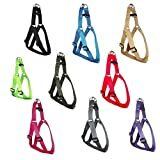 The harness clips easily into the car and keeps you dog still and secure during your journey. It is advisable to use this type of harness from a young age with your dog as it often takes time for your pal to get used to the harness. Dog halters, otherwise known as head halters are a good method of controlling your animal. They are especially useful for young and exuberant dogs and can be a good method of training your pal how to behave when out for walkies. The halters provide a large degree of control over the animals head and this enables you to stop your friend paying unwanted attention to other people or animals. If you are concerned about your dog's temperament then this is a good way of keeping piece of mind whilst you are out. Let's face it, not all of our four legged friends are good with children, cats or passing motorbikes so if you are concerned then we at lovingyourpet.co.uk highly recommend a dog halter as a sound investment. Both halters and harnesses are relatively cheap to buy, however for the comfort and safety of your animal it is crucial that you buy the correct size. If you are unsure, consult your local vet or pet shop who will be able to advise you easily.